I want to get healthier. I want to be more physically fit, and I want to have more energy in my daily routine. Now, this doesn’t make me special. If you went outside and threw a rock right now, you would probably hit somebody that agrees with one of those statements. Everyone wants to get healthier in some area, whether that be with their body, a pattern of behavior, or in their relationships. I don’t want to meet any weight “goals” or muscle-building “benchmarks”. I just want to get healthier to be happier. I find that I have more energy, a more positive outlook, and just flat-out better days when I work out. I feel like I’m also nicer to people, I get more work done, and I’m more fun to be around. I don’t feel as run-down or lazy if I spend 15 minutes running. That seems like a pretty small commitment to having a better day, doesn’t it? If you sleep 8 hours a day, that leaves you 16 hours to do something. The 15 minutes spent running represents 1.56% of my “awake” day. And if 1.56% can get me healthier, and makes me happier, then why not spend the 15 minutes that way? What if I decided to dedicate a little more time? What if you joined in with me? I want to take a journey to see if I can be happier by being healthier. If I lose weight or gain muscle during this process, great! If I look like Channing Tatum at the end of this, I’m onto something. But if my only results are being more engaged in my relationships, having more energy at work, and having a more positive attitude, then this will have been a fantastic success. My goal for this journey is to live a more satisfying life. Who doesn’t want that? 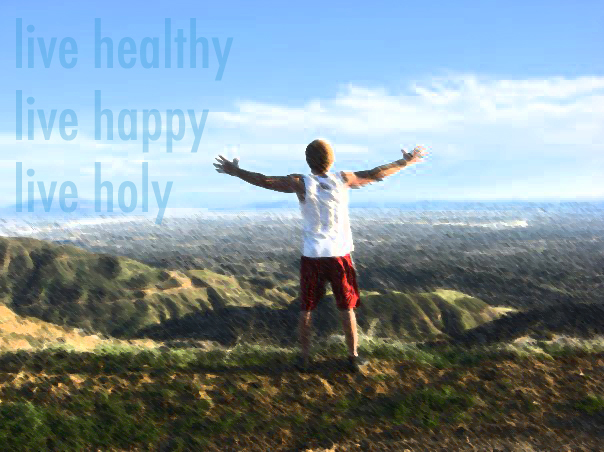 But health is just one element of true happiness. I want to test something as a Christian believer. I want to see if I can live healthier and happier and if they are somehow related to a relationship with God, because this verse seems to be saying something that I have missed. This verse tells me God created my body. If God created us, He must want us to have a full, satisfying life, right? I can’t imagine He would spend all that time giving us intricate bodies, complex personalities, and a variety of skills just to sit on the couch and eat buffalo wings all day. God tells us that he lives within us and that our bodies are His temple in this verse, but when was the last time you treated your body like God’s house? Many of us, myself especially, reach for another cinnamon roll or throw down a dozen extra beers on Friday without ever thinking of God. Or our bodies. Now, before you start throwing things at this screen, let me say one thing: God loves you. I’m not a pastor, but I’m convinced of that fact. And He loves you the same regardless of whether you are preparing for Miss America pageants or you are sucking cheesy puff residue off your fingers right now so you can scroll easier. His love doesn’t change. By the same token, if He truly is living within you, then at the very least it should be a sign of respect to take care of the body He has blessed you with. This is what I’ve been thinking about in my own life, and this is what has urged me to start this journey.